After you’ve been “home” for a few months and have told the same story countless times, you start to wonder if you might have completely run out of more “original” material. How many times did I tell the one about the cow parts in the trunk of the taxi? How many times do I tell that one to the same people who had already read about it on the blog? Am I even interesting anymore or have I just turned into that person who only has one unusual story and tells it over and over and over? 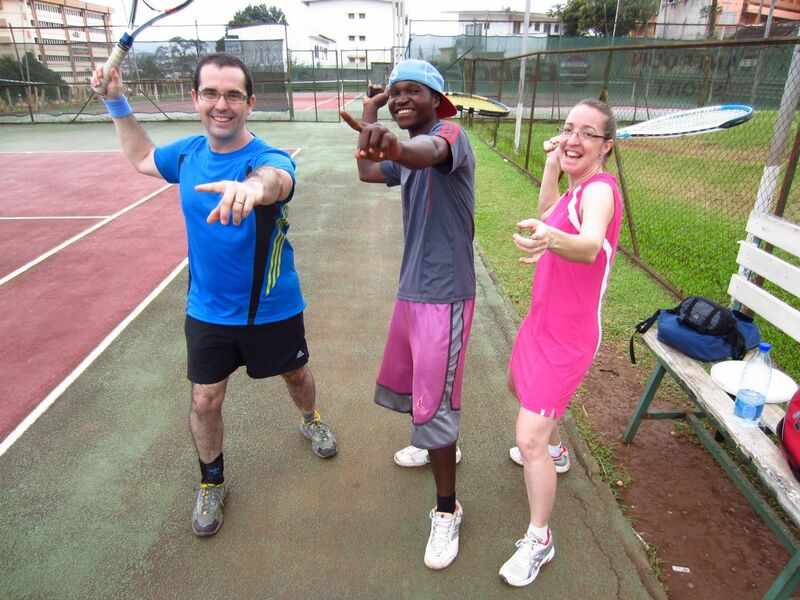 About 8-months into our Yaoundé adventure, Greg and I needed to move to a new house. The previous one was termite infested, had a resident kitchen mouse (or five, who knows) and an open septic tank that hadn’t been cleaned out properly and would make us gag on a daily basis. We had found a new place that was better taken care of, and, tough it also had an open septic tank, it didn’t reek. Our standards having re-adjusted themselves to the realities of life, we accepted the move wholeheartedly. The wrinkle in this chapter was that we would be able to move in on Friday afternoon – just under twelve hours before Greg would be taking a plane to Nigeria for a work-related conference. No problem though. Being used to packing-moving-unpacking on a semi-regular basis, we found a way to make it work. We moved in, made the bed and went to sleep. It was a short night. We weren’t used to the sounds of this place. People talking, dogs barking, music playing. Engines roaring, doors banging, horns honking. Scratching, tugging, growling. Scraping, running, screeching. Come 4am, Greg got up to take a quick shower before being picked up by our regular taxi. There was only a dribble. What we found out later was that due to a leak at the main tap, the caretaker would only turn on the water when we asked so as to prevent the water bill from getting sky high. At 4am, the water was off. The husband was on the side of cranky, but dutifully resigned. This is life. He slapped on a smile and carried on. Not much later than 5am, Greg was out the door. Kiss, kiss. See you in a week. Hug, hug. Did you hear that weird noise last night? Which one? Hope the new place isn’t too scary by yourself. Being as I was alone, the household yet to be unpacked and the sun hadn’t dared to get up yet (lazy bum), I went back to bed (not lazy, just practical!). With the stress of packing and moving, and the beauty of having a whole big bed to myself, I dozed off easily. Then I was woken up. Yelping. High pinched ones. The kind you have no idea where they come from – direction and source – and aren’t quite sure you want to know. It still felt to early to get up so I wrapped a pillow back over my head and looked for slumber once more. Yelp, yelp. Whine, whine. Crying… Voices. Splashing, yelping, whining. Silence. I won’t say this was the best strategy, but I didn’t go out to look at what was going on. I just burrowed in the safety of the strangeness and unfamiliarity of the inside of the house, and really didn’t care what might be happening outside. Sometimes the sensory overload is just too much. That morning, every sound seemed tortured and while I wasn’t scared per se, I was feeling a bit overwhelmed and tired. We never quite looked at that puppy the same way after that! The excitement of “coming home” has only worn off by a few degrees as, now two full month in, we are still having firsts. The first time eating sushi, oreo cookies and soy pumpkin chai latte (but not all at once!). The first time riding in a public bus, the BC ferry or driving a car. The first snow, the first time wearing mittens, the first feel of sub-zero temperatures. But now I can’t remember the other firsts. First trip to the grocery store, first load of laundry, first bubble bath. Then there are other firsts. I can’t remember who first asked: “how was your trip?” That’s likely a good thing. When teachers say there is no such thing as a stupid question, they don’t mean this one. Not that it’s a stupid question, but only that is boggles the mind. FYI and for future reference, 2 years isn’t a trip… it’s a toddler. And how do you deal with toddlers and the terrible twos? You appreciate the growth and development being experienced, forgive the awkwardness of their social interactions and make sure not to feed them too much sugar! End of rant. Deep breath in, rant out. That’s better. But it’s not good enough, is it? Come on – they ask – what’s are you going to do now? Where are you going to live? Are you staying in Canada? What about work? Where are you going to find a job? It’s not a bad question, really. It’s not even a complicated one. And while I know we should have a well-packaged answer, the reality is that we don’t have one that will satisfy even the least curious nor the best-intention inquirer. Some volunteers go back to their homes and their old job. Some head back to school or “reoffend” by volunteering again. We are not that different. We’re still working from the same storyboard – only it’s now adjusted to our new experiences and to the lessons we have learned. Going “back to” isn’t part of that game plan. Two years ago we embarked on this adventure with the hope of gaining new insights that would propel us into a new future that was filled with what we most wanted to do with our lives. In this way, it’s been a blessing. We know so much more about what makes us tick, what gets us up in the morning, and what sustains us through challenging situations. We know where our hearts are and what we most want to do going forward. An interesting cosmic thing has been happening lately that has made the game plan look like a tactical response to an alien invasion. Each time decided to “take a break” and go check out a particular tennis shop in Montreal, something happened which prevented not only that shopping trip, but the rest of the week’s activities were also turned upside down. We were beginning to think that this store was cursed, or that any well-laid plans on our part are contrary to the forces of serendipity. Then it started happening with other stores too… So we just stopped thinking more than two-days ahead. At most. Either way, we are approaching our “what next” dilemma with extreme flexibility. Greg’s approach is one of situational opportunity. Within a couple of weeks of our return, he answered the door when opportunity first came knocking. He’s presently filling in a short-term need with CUSO International which had him visiting two Latin American countries, doing multiple trips to our lovely Canadian capital and working with a whole new group of hardworking staff and volunteers. All of this while he’s figuring out what the “next challenge” really is and where it might be taking us. As for me, I have taken a challenge and conquer approach. I have been getting my little project ducks in a row and have begun to coach them, each in turn, about how to become beautiful swans. I learned how to knit socks and I wrote my heart out for National Novel Writing Month. All of this while I’m doing what I can to support our common dreams and figuring out how best to pack and repack a mosquito net. Big decisions ahead. We’ll call it the “next first” and celebrate it as an answer to all major life questions. Just think for a moment … how you would answer that question in your own community? Then read on below to see just a few of the opportunities these 6 people from Bamenda and Wum came up with – and these are only the few that I forced myself to narrow it down to! Having worked in this field in Canada and the US, I can tell you right now that few of us could gather the breadth of images and stories the small group of IDF volunteers and beneficiaries did in a week’s time. And I say this because, once you tick all the boxes of challenges they have faced – being orphaned, disabled, unemployed, living in quarters without garbage collection, potholed dirt roads, thievery, you name it – they highlighted some great [read: achievable] ideas for future work. 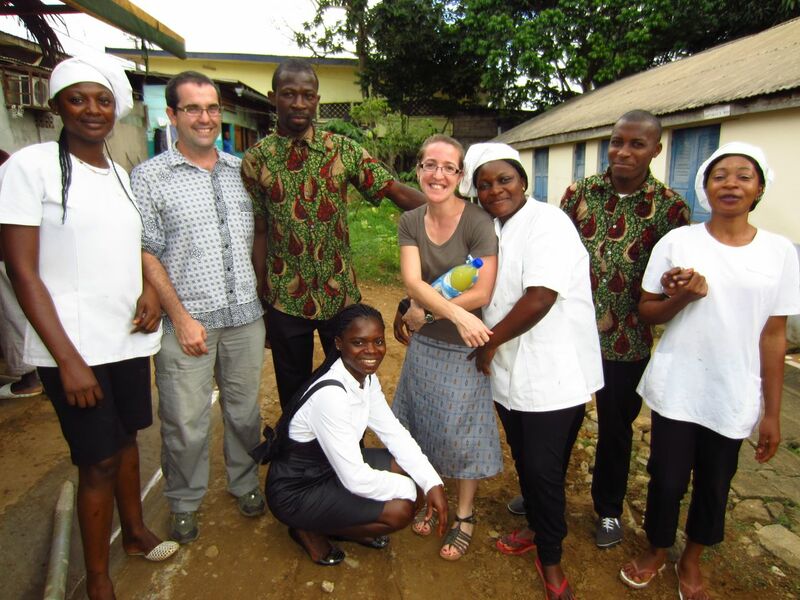 They not only took pictures that showed the reality of their lives and their community, but they provided a long list of opportunities that have the true [read: credible and feasible] potential to make a difference – for themselves, their families, their community, IDF and VSO Cameroon. The economic development part of my brain could see the possibilities. Take any of those energetic people and let them be who they really are for IDF: role models. Let them speak about what they did to reach where they are. Let them teach others about what they do. Let them be the marketing arm for sensitization about sanitation and waterways, building bridges and roads, building places where community can come together, and training orphans and vulnerable children (OVCs) to have the confidence and the skills to take care of themselves. Let them be the faces and voices of dedication towards greater local economic success… Already in this one photovoice project, they have demonstrated that they already are. 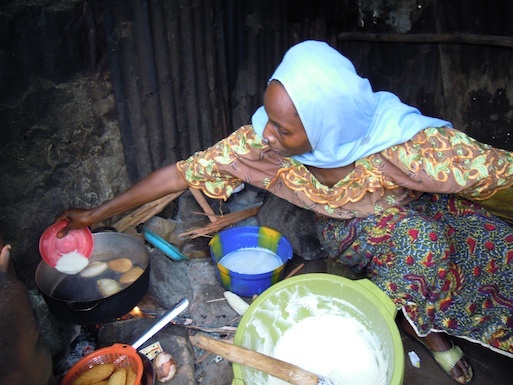 This woman is frying akra beans. You can see the woman is well protected from the fire. There is an opportunity to teach others how one can be self-employed. That woman is self-employed. The opportunity is for others to learn. She works very well. We can see the number of people that eat there. You would not believe yourself. When I leave my church in the morning and I pass and buy akra I will take for my breakfast. Even those with only 100 francs can eat there. If the woman doesn’t sell, I don’t have my breakfast. 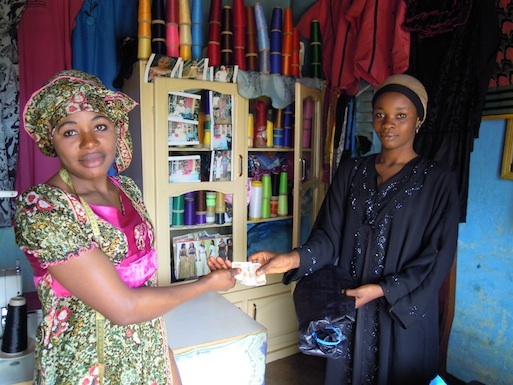 Her business is very important because it contributes to the local economy. 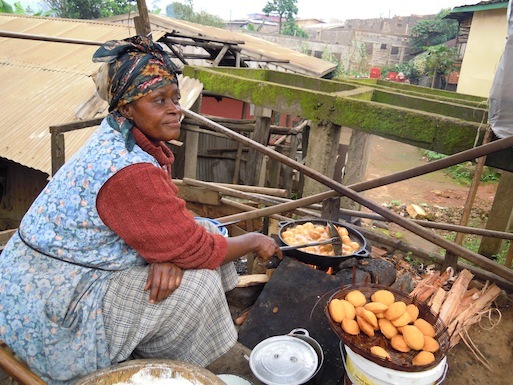 Because the day this woman doesn’t prepare this food, you will see those truck pushers who are rushing to come and eat, when they come and don’t see her, you will see them standing there like orphans. This picture shows typical northwest traditional dress regalia and culture. This is actually my handwork – what I do. When I left school I struggled to pick a job somewhere and decided to open small workshop since I grew up with this. Economically it is what I am feeding my family and helping other people in the community. Through this I have discovered that self-employment is easier. I have trained no less than 100 children. The picture you see is one of my apprentices who is working there. Economically I can say that this has made me not to regret that I wasted my time in school because I use my academic knowledge on the designs that I put there. I am proud with it because I trained many people who feed their family and train others and the thing keeps on going. Now it is like a hot cake for us because the government itself is developing some interest now in the traditional northwest regalia because now we are using them for instance when we were going there for the World Cup, most of the Cameroonians were using this, when we went for the Nations Cup, most of the Cameroonians used but the NW regalia. Any political figure in Cameroon who want to signify with this and the northwest people and the northwest. 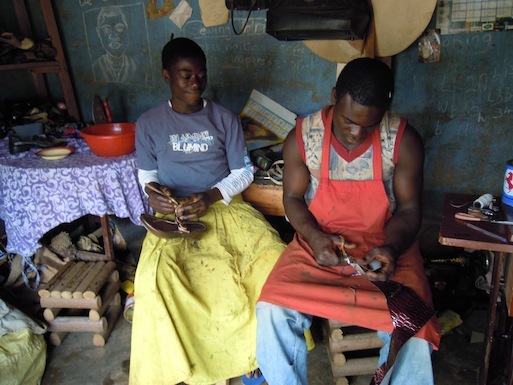 This picture shows what I do for work as a shoe mender. This is my apprentice in the picture and he is disabled man. I want to show that he can do more than one able can – he is my first apprentice. My mother was dead, my father was dead. I am an orphan and IDF helped me enter into this work. They asked, “you want to go to school?” I said, “no – I have my brother and my sister and they are doing nothing. If you can really help me to have something to be doing or selling something.” They said, “you can come and train for business”, I said “OK you can put me to any workshop that I need, I can do best in doing the work”. Now I am patron (boss) by myself and I can train many people. The picture is showing what a disabled man can do. If you are disable you cannot stay in the house. You can do something. Even you can move your crutches like this one by his side. Even people like this can work. Here you see a point where the inhabitants of my community they do dump refuse. On one side of the bridge you see it is very clean at present. On the other side you see they are dumping refuse on that other side which is not my community. If you look closely, the other side is another quarter where there is no garbage beside the stream after a sensitization campaign. 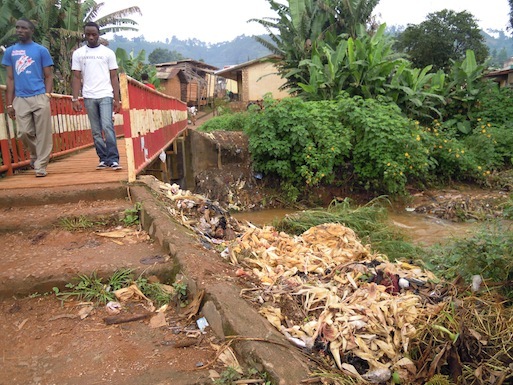 Under IDF, we went out and sensitized the quarter about the poor disposal of raw sewage and refuse. I took a small portion of our community to do my study. I went around to every household. I collected the refuse from the household. I came to some land I had left, I selected the metallic substances, like I grouped copper, iron, tins, plastic container. What is remaining like this in the picture, I made a pit for compost manure. After that, I realised the amount of refuse being dumped on our own site had dropped. So I went on and then I saw that from the copper a kilo sold for 1700 francs so the bits of copper I received I could use to raise small income. Then also from the market women I made contacts and I collected from the ones who sell huckleberry, their own refuse I had another use not for compost. Aluminium a kilo is 600 francs. Then the compost manure, at times, in the season when the farmer do cultivation, you can have a quart of compost manure for 1000 francs. That is how we can recycle sewage from our own homes. If another person was doing what I am doing on the other side of the river, that’s enough indication that this other side could be clean. I am owner of this small place and this is where I try to earn a living. You have some shoes, curtains, and a few dresses plus those machines. The opportunity I have in this business because I came to Bamenda after working for a company that for two years did not pay us. 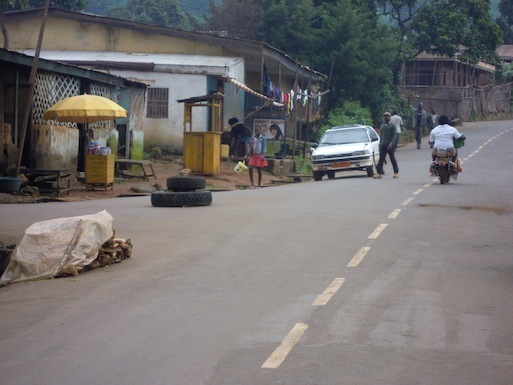 I was in Yaoundé, I was forced to come back, being harassed by the landlord everywhere I was going and I came back home. God so blessed, I have a father that man who is very pushful. 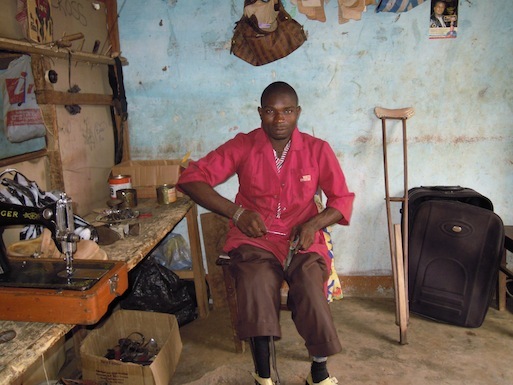 He went on retirement in the days of the Western Cameroon and his pension is 6000 francs. 6000. Not 60,000, not 16,000. 6,000. So my father is a hard worker that he is like that, he goes to the farm. He works like a woman. He told me “my child, let’s not stay like this. 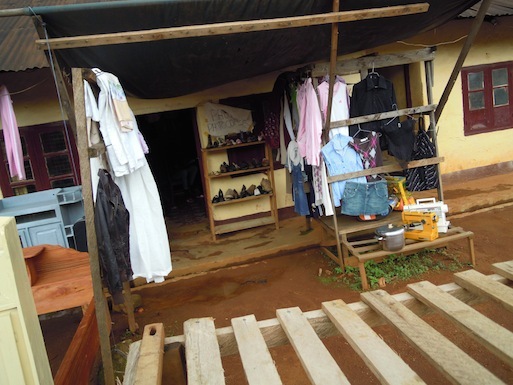 You are from Yaoundé, you are back home, you are not paying rent, let’s be going to the farm and working.” And it is from that farm that after we sold some of our items from the farm, I had small money that I could start this small business like this. Though small as it is, I am happy with it because the opportunities that comes out of this is that I pass my time here. Where you have a place to pass your time, you avoid many problems like gossiping all those types of things in the quarter. It helps me to generate income. At least I can sell an item there that will buy books for my children. I took this picture to show that one must not have a very big capital before starting a business. You can even start with the least you have. And while this is going on your knowledge is developing, you can sell one things, and buy two or you still buy just one. It helps at least, there are days that I come there that I will have 500 francs to go and manage and buy food for me and my children. 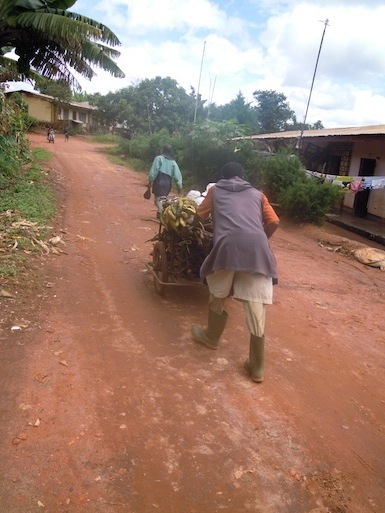 Not the suffering we used to suffer in Yaoundé when they were harassing us up and down. So it is very important to me in that way. This is the main road in my quarter. You can see how clean it is, you can see small business persons a motor taxi on the road, a salon and wood being sold by the roadside. This is an opportunity to show how my quarter is booming economically. When someone looks at this picture they can see how the sanitation situation in the quarter is very stable by keeping the roads clean. Like after selling her wood, the woman will have to sweep her portion to keep it clean so she can use it next time. Why is this important? Because this road is something we have been crying for so many years and finally got accepted by providing us this road. Now you can see small business by the roadside. This proves that the quarter is growing economically. Up here is a new building being constructed for more stores. It means it is inviting more investors into the quarter. And on my own part, it is very important because the more inhabitants come, the more I will have registrations for my association. The secret is you must know how to talk to people. Be friendly, don’t be arrogant, don’t be rude. Try to make them your friend. Make some jokes with them. It’s been long about 8 years with IDF. She (IDF’s coordinator) taught me how to associate with people, she taught us how to talk to people, how to talk to community. And they will all gain what you gain as if it’s magic. That is it, that is my secret. It comes from IDF. Because she taught me all that before I was even became the manager which I now have to manage all the services. It’s because of IDF, the knowledge I get it from here. To know how to talk to people that’s all. Because to bring people together and let them understand is very difficult. So if you can do that, then I think you don’t have any trouble. Last month, four of us volunteers (Aysha, Rosy, Greg and Caroline) facilitated a two-part photovoice project with MUSAB as part of VSO’s Inclusion Enhanced country-wide focus on participatory monitoring and evaluation which Greg has been managing. Through the use of participatory photography, MUSAB’s beneficiaries and volunteers examined the impacts of previous projects and explored possible new avenues for interventions in livelihoods support. 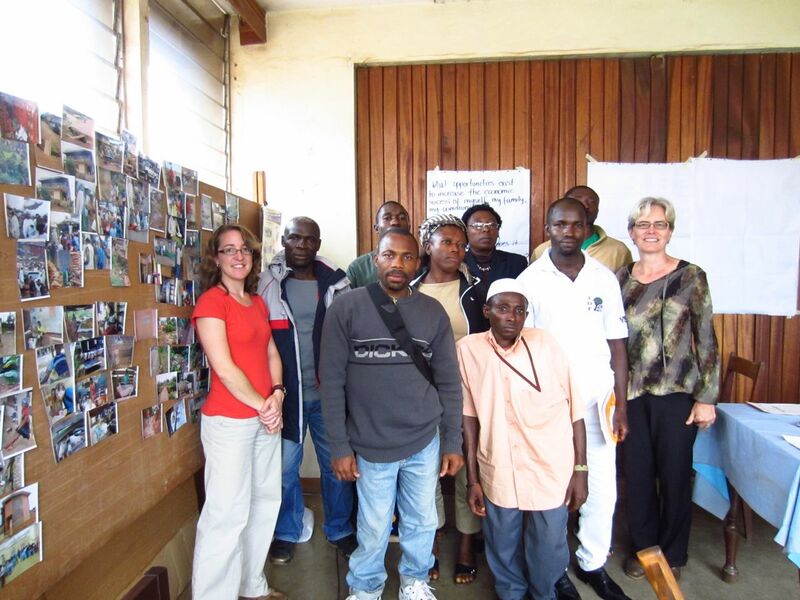 VSO Cameroon has partnered with MUSAB on many of these projects. There were 5 participants – some beneficiaries, some volunteers, some who were a little bit of both. In the week and a half period that the project ran, they took 189 photos and covered the gamut of intervention ideas: microfinance, agricultural enhancements, training for orphans and vulnerable children, income-generating opportunities, business support, etc. Many of the pictures and stories they shared really stood out. Here are a selected few of those that illustrate their thoughts and ideas. The woman standing in this picture is my wife she is a business woman. She is a dress making. She make a business. She sells thread, needle. She makes patterns. So the woman is selling to her customers. 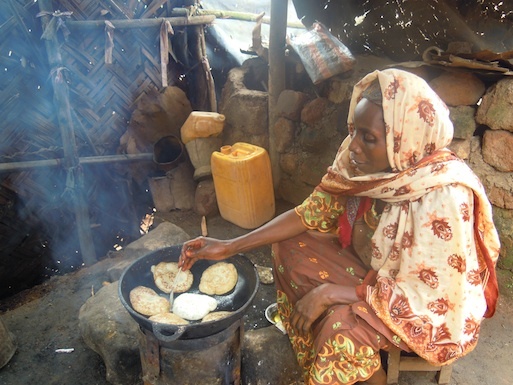 According to her life was so difficult for her when she was not working, but now as she is working she is able to feed herself, pay her rent, take care of her family. She is happy. She is saying that if she has enough capital she thinks she will make it better than this. [In the first picture] you can see that’s him before. Before he was using a truck to transport people’s goods from one place to another and they usually give him something. With that thing he can help himself since he’s an orphan. After when MUSAB came in they helped him through his mother. His mother is a widow. So they gave her a loan. With that loan she saw that the child was somehow push full, so she helped the child by giving the child capital. 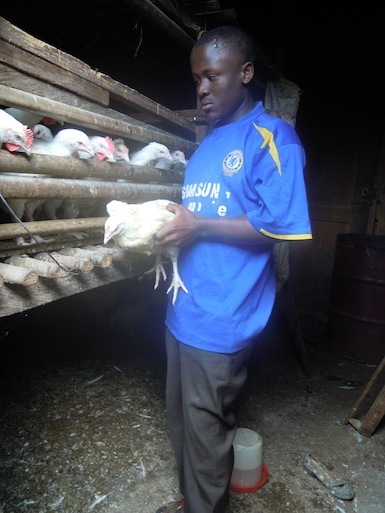 He decided to keep fowls. As you can see those are his fowls there. Now they are grown up. He can now sell some. When he sells he can go to evening classes. So he has gone back to school. He uses his manure in the farm. He has been raising chickens for 2 years. He feels very happy because now at least he can pay his own school fees. He also helps the family. He learned how to raise the fowl from talking to people. The mother is also helping him. When the mother learns from educational talks she takes it back to the house and explains it to him. This picture shows your girls who go to the market and learn plaiting. MUSAB can also involve their girl OVCs (Orphans and Vulnerable Children) in this plaiting. 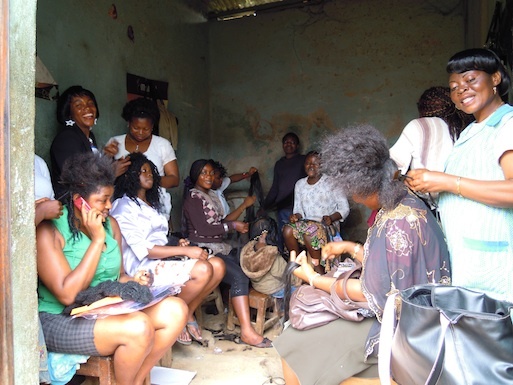 Train them for plaiting and they can go out and manage themselves, employ themselves, feed themselves and their family and also take good care of the community by plaiting the women so that the women should look fine. Also [they earn income to] educate their own children and families. I am a widow with eight children in a two bedroom house. 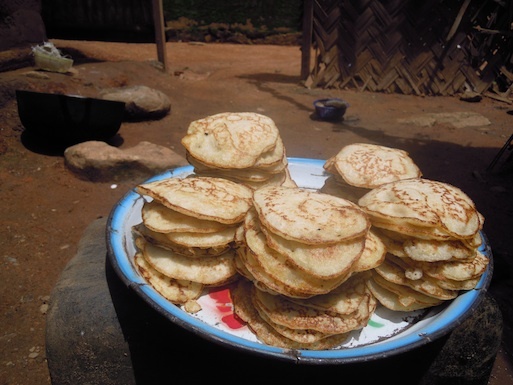 Out of my income-generating activity, I am able to do many things like pop-pop, akra beans, pancakes and what we call in Hausa language masa. [The impact of MUSAB] is that I am able to help myself and my children to feed, clothes and even send some to a vocational training for tailoring. It’s important to others because when my children are out for selling [the food products] and it got finished before reaching others, they get very angry at them. That’s what makes me feel I’m important to others. It’s quite a bit of fun when you can call your hobby “work” – at least for a little while. And all the more wonderful when it might just be for a good cause! 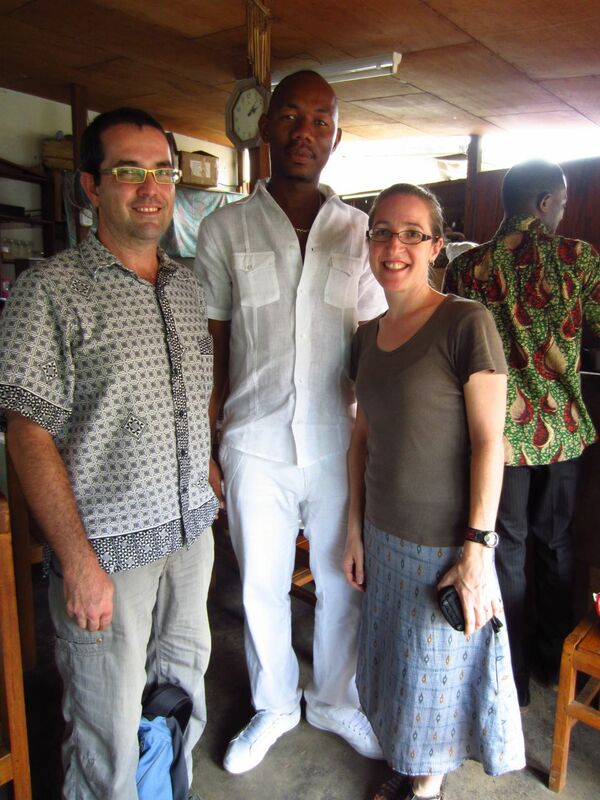 I got that chance because IDF’s coordinator, Oussematou, found out (thanks to Catherine!) 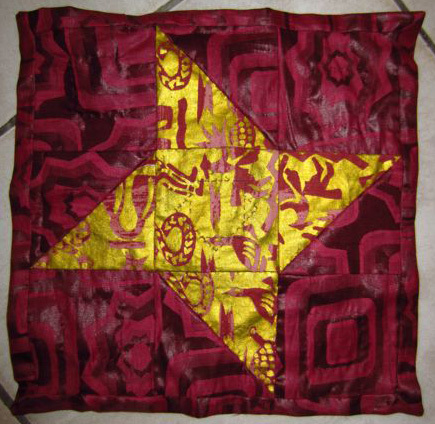 that I am an avid quilter and could be easily whisked away to Bamenda to give a workshop on it. As the old VSO slogan used to say: sharing skills, changing lives. Not so sure we intended to change lives, but hey if you can pardon my lame commentary… if life is giving you scraps… make a quilt! 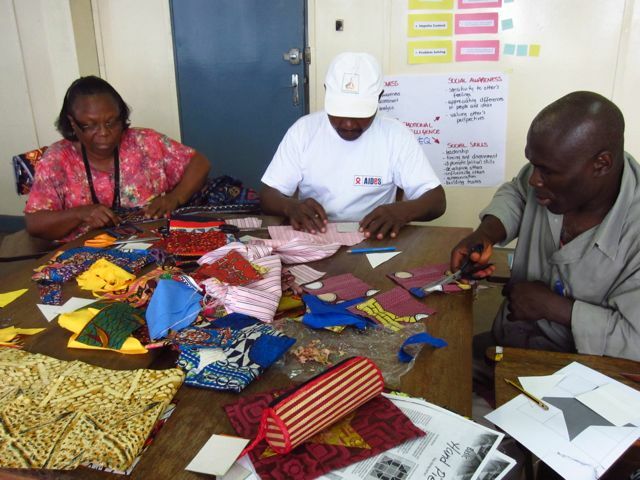 Oh, enough with the silliness… Here is what the original plan was: do a two-day hand quilting training with women infected/affected by HIV so that they can quilt as a support group and then perhaps, with experience, turn it into an income generating activity. 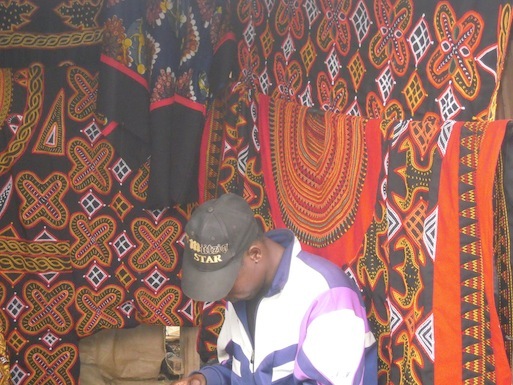 Instead, this is what took place: Oussematou gathered two gentlemen around her (another woman – a seamstress no less – was also supposed to come but cancelled due to a death in the family) and we did a quick one-day quilting lesson! The idea was that these three apprenticeswould then start to train others when they feel more confident with the needle. Right, well… maybe not doing the whole changing lives thing, but at least there’s a chance for this bit of skill to carry forward. I picked a relatively simple pattern – friendship star – and put together a bunch of handouts, including visual instructions and other sample templates. Then I grabbed my sewing kit, invited fellow quitling volunteer (Cornelia) to join in and turned IDF’s conference room into a quilter’s retreat! It was an absolute blast AND a learning lesson for me about teaching hand quilting. 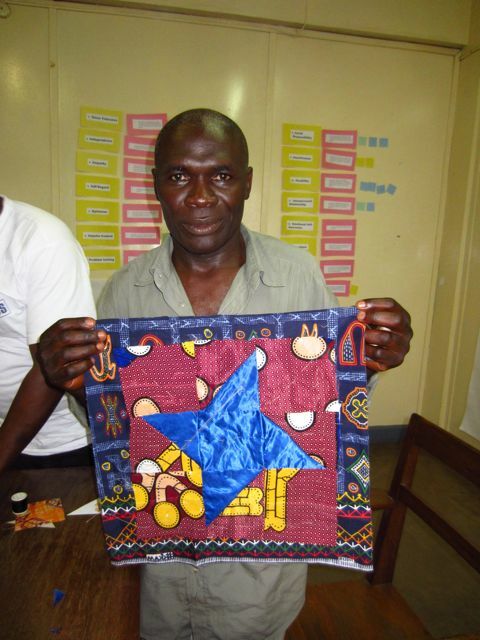 Besides Oussematou who had learned to quilt some years ago, the other two gentlemen had quite different skills. 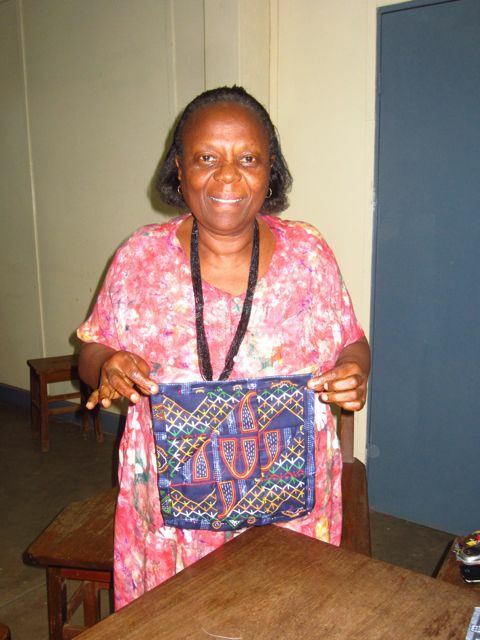 One is self-employed doing traditional North West Cameroonian embroidery. The other, I suspect, had never before stitched even a button onto a shirt. So now I totally understand the amount of patience and creativity necessary to teach in general, but also to teach people of different skill levels. It’s very interesting teaching to someone who has allergic reactions to following instructions! But, on the inside of course, my little voice was screaming and my quilting genes were crying just a little!!! I kept telling myself that when they see it all come together and they see their own mistakes, they will start to appreciate the teachings and the need for greater precision. In quilting, a few millimeters do make a difference, but I guess that’s hard to believe until you see the results yourself. All in all, it was a really fun day. We littered the floor with bits of fabric. We lost out templates beneath a pile of remnants (thanks Cornelia! ), and, for all my nervousness, we did not lose my grandma’s sewing scissors! More silent curses were uttered in threading the needles rather than in doing the stitching – so I know things were going pretty well. Best of all, everyone completed one block and attached the backing to it. Everyone started doing some “stitch in the ditch” work around their star, and I showed them how to complete the binding so they could properly finish another day. 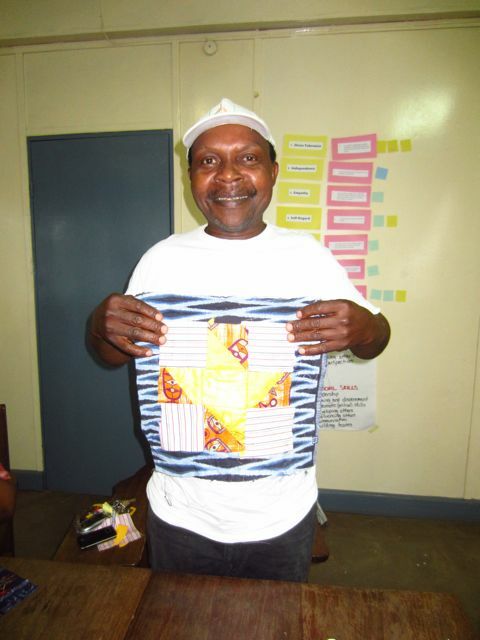 So, yeah, quite literally… quilts without borders! Everyone left with a smile on his or her face (including me! – well OK maybe mostly me! )… and a few more scraps have now become stars!!! Friendships one at that! 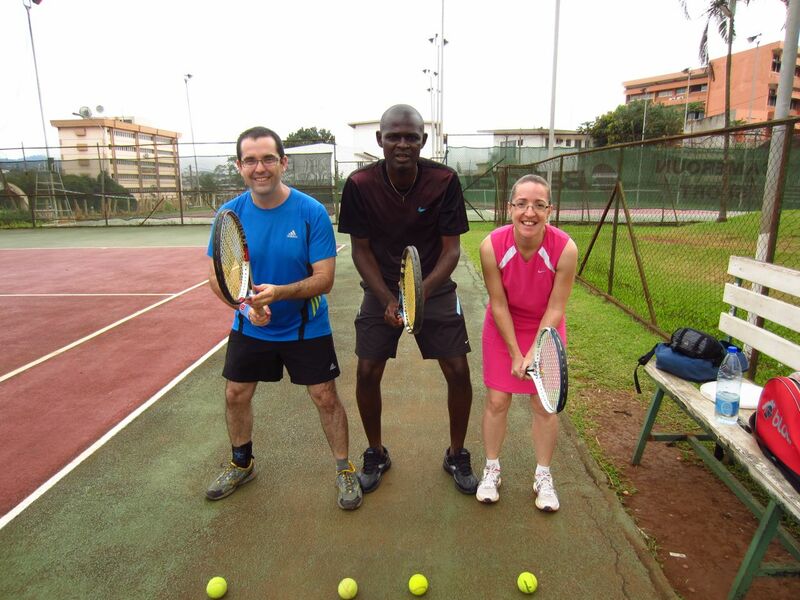 For weeks I have been both looking forward to and dreading this last day of coaching training with IDF in Bamenda. This was the follow-up to the coaching workshop from last May. Not that I didn’t want to be talking about coaching with them again, but because I was nervous about just how much they had retained and how likely it was they would want to continue to build a coaching culture within their organization. As always, I had no reason for the sleepless nights. There is space in IDF’s heart for coaching and a great desire to continue the relationship with Coaching the Global Village who provided me with the curriculum, the funding and the support to make it all happen. I had connected with 5 of the training participants a few weeks ago and had a better idea of where they were at individually. We’d been able to speak one-on-one about their coaching experiences so far, and what challenges they had faced. This last day of training, however, was aimed at doing knowledge-sharing between the participants and also at further solidifying their coaching skills so that they can continue to grow as coaches. I had planned a full-day of experiential learning, and while a great laid out plan helps, it was tossed out the window in the first five minutes! Because of unforeseen difficulties with another IDF project, we had to cut the training short, but by strong request from the participants, we didn’t shirk the work one tiny bit! If I had had a checklist, it would have been nearly filled! The highlights for me in this marathon coaching training were that I am now truly convinced this group of people see the value in coaching as a tool for development. To start from the end, I asked the participants to conclude the day by preparing a passionate sales pitch that they could employ in convincing their colleagues, the community volunteers in the field and their many partners, to include coaching in their activities. I didn’t know what to expect (always a gamble to use expressions like “sales pitch” when you don’t know if it translates in the local receiving culture!). But I was impressed. They all said that even though coaching wasn’t mainstreamed in Africa yet, they believed they could be at the forefront of its adoption into their activities. IDF may not be the first organization to receive coaching training in Africa, but the feeling that they are innovators is a gargantuan motivator – it gives them the opportunity to be, feel, and act like pioneers. The training itself – a continuation of the Creative Leadership Conversations methodology – went quite well: We reviewed the mainstays of coaching. We spent a long time discussing how to build relationships that create the space for effective coaching. We talked about the long-term approach to working with hard to reach groups. Participants shared their thoughts about how they thought their listening skills were improving. They collectively commiserated about the difficulty of fully clearing one’s mind, being entirely focused and present in a coaching conversation. Every opening I had, I asked them to comment on the cultural differences and challenges coaching and the CLC methodology presented. For instance, it is unusual, they said, for persons in Cameroon to have a “vision” as we define it in the West. I kept being told by other people that usually people live day-to-day, hand-to-mouth. To clarify visioning, however, I shared with them that in Canada we often ask small children “what do you want to be when you grow up” and that we fully expect an answer (no matter how farfetched). I didn’t think this was the case here, but I had to check. They agreed with my assessment. They told me that was the challenge. I get goose bumps just thinking about it. After two years of working in Cameroon, I was starting to think my cynicism was clouding my vision (pardon the pun). I could see from their animated discussion that coaching wasn’t just a tool they could use to empower their beneficiaries and improve their working culture. The four participants – these shiny new coaches – are actually seeing this as a tool for cultural change! My, oh my, what have I started now? Visioning as a grassroots cultural revolution??? Yikes. But then again, Yippie! They tell me that the concept of time in Africa (or how they themselves see it anyway) makes visioning a foreign concept. They know there is a challenge to making this more engrained in their activities. 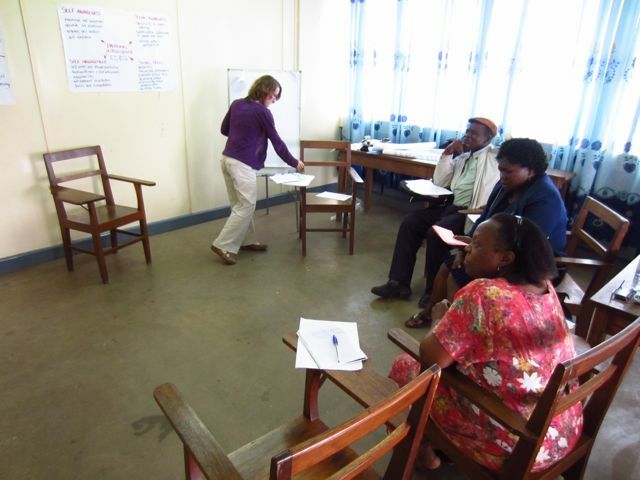 They talked about – and made action plans towards – the development of awareness building of coaching as a tool and visioning as an agent to positive change. By then, even the remaining discussion on Emotional Intelligence – that it matters less what we know than how we use what we know – we were rolling around in gold. We looked back at their shared experiences and were able to comment on the fact that they were, unknowingly, building their EQ skills each and every day. Just by the fact that they were asking for confirmation and support for the way they had used coaching in various instances was evidence enough. Still didn’t do it justice, but the groundwork has been laid. Lastly we worked on a “passionate” action plan (which led to the sales pitch mentioned above) for growing a coaching culture in IDF. We developed actions that would bring the organization closer to their vision: a greater use of coaching in the organization which would lead to the empowerment of beneficiaries to reach their own vision and goals – a vision that is now clearer and achievable! Good job IDF coaches… and good coaching! We are together.